Biomagnification is the process which is said to be the tendency of pollutants, which an increase the concentration of a substance, such as the pesticide DDT, occurs in a food chain. • Biomagnification occurs when organisms at the bottom of the food chain concentrate the material above its concentration in the surrounding soil or water. • Biomagnifications occurs mainly in food chain tropic level process. • Biological magnification, also called as biomagnification or bioamplification. • Bioaccumulation -The accumulation of compounds in animal or plant tissue over time that can’t be excreted from the organism, which occurs within tropic levels. 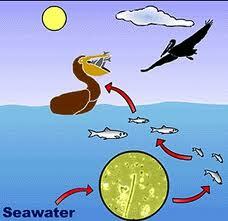 • Bioconcentration - Occurs when uptake from the water is greater than excretion. 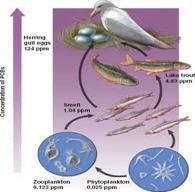 • Biodilution - opposite of Biomagnification- Pollutants get smaller in concentration as it takes place in food web. Small concentrations of chemicals in the environment can find their way into organisms in high enough dosages to cause problems. • DDT stands for dichloro, diphenyl trichloroethane. • Cyanide reports a spill of toxic substance. • Selenium cause reproductive failures. • Mechanical injury, strangulation, or starvation can be caused when Plastics are eaten by many organisms. • Oil spills are a serious problem in marine environments. 1. Cannot be easily metabolized, and does not break down in the body. 2. Soluble in fat than in water and hence accumulates in body fat and is not excreted. 3. DDT is deadly or may have more insidious, long-term effects. 4. Interferes with the deposition of calcium in the shells of the bird's eggs. The eggs laid are very soft and easily broken; birds so afflicted are rarely able to raise young and this causes a decline in bird’s numbers. 5. DDT accumulates in the fat tissue of animals at the top of the food chain. Want to know more about Biomagnifications? Click here to schedule live help from a certified Tutor!